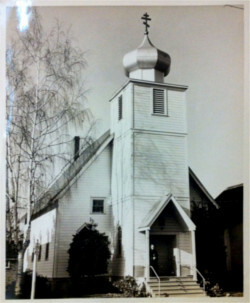 St. Nicholas Parish counts its roots to a tiny Orthodox chapel at the corner of what is now SE 20th and Belmont. Built by a Russian-Aleut named Lavrenti Chernov Stevens, who had recently moved to what was then the wilds of outer Portland, the chapel soon collected a congregation of about 12 souls — Aleut Creoles, Serbs, Arabs, and Russians. From this modest beginning, more than 10 Orthodox churches have been established. Even though it was a small church, the community was host to two legendary evangelists around the turn of the 20th century. The first, on February 25, 1895, was from the San Francisco-based missionary priest, Father Sebastian Dabovich. 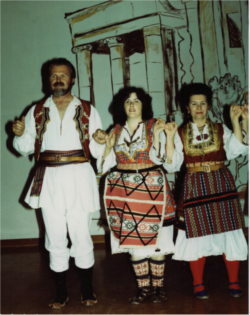 He celebrated the first Orthodox divine services in the chapel, which was at that time dedicated to the Most Holy Trinity. Father Sebastian died in Serbia in 1940 and is being considered as a possible saint. (For more information about Father Sebastian and other American saints, see the book Portraits of American Saints, by Father George Gray. Next, sometime about the turn of the century, St. Tikhon (later, St. Tikhon of Moscow) made a hierarchical visit to Portland and served in the chapel. At that time, there was no permanent priest assigned to Portland. 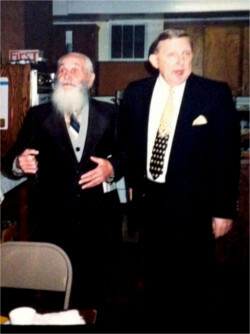 For a number of years, the tiny community received pastoral visitations were made from Father Michael Andreades of Seattle or Father Sebastian Dabovich of San Francisco. Eventually the chapel fell into disrepair, and the Orthodox community began to fragment. 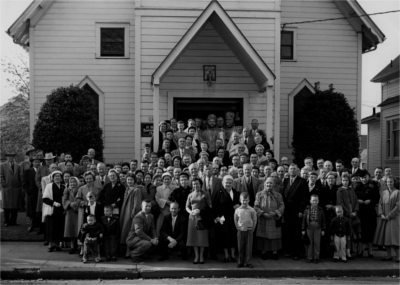 In 1927, the Orthodox faithful renewed their efforts as a community and began meeting in a house-church in North Portland. The pastor at the time was Father Constantine Lebedev. Within two years, during the pastorate of Father John Zlobin the congregation bought a church building on Northeast Mallory Avenue from the German Brethren congregation. The parish became incorporated and was then placed under the heavenly patronage of St. Nicholas the Wonderworker. Construction of a Holy Table (altar) and the consecration of that building took place on June 10, 1928. With the blessing of Metropolitan PLATON (Rozhdestvensky), Bishop ALEXEI (Panteleev) presided at the services, joined by Orthodox and clergy and faithful from Portland, Seattle, and San Francisco. The parish community remained at the Mallory Avenue location for the next 50 years and saw no less than 16 pastors come and go during this time. During this time, monumental changes were taking place around the world, and the small Orthodox community in Portland felt their effects. The Community became more Russian in language, customs, and liturgical practices. The Orthodox Church in America received autocephaly from the Russian Orthodox Church. The parish transitioned to the new calendar. English was gradually introduced into the Liturgy. All of these changes took their toll on the congregation. The Greeks formed their own community, retaining the name of the original chapel: Holy Trinity. 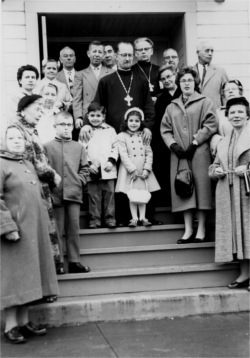 The Arabs followed suit, naming their congregation St. George Orthodox Church. 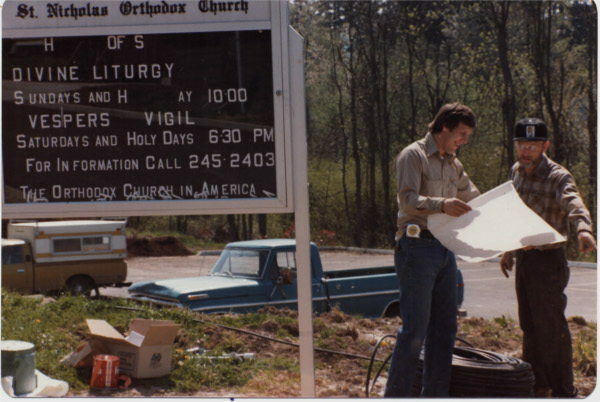 In the late 1970s, St. Nicholas received property for a new church in Southwest Portland. 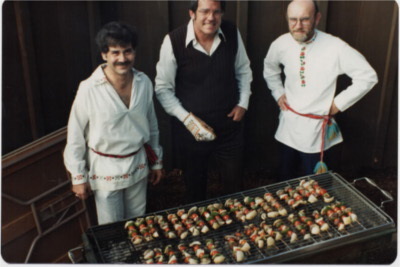 In 1978, under the pastorate of Father Seraphim Gisetti, the parish began holding services at the parish hall of the St. Clare Roman Catholic Church, close to their new property. 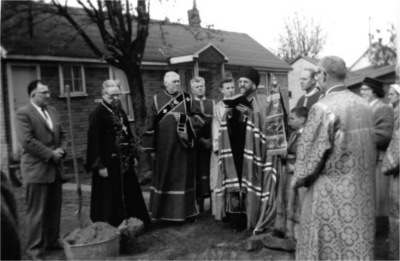 On December 10, 1978, Bishop (now Archbishop) DMITRI (Royster) broke ground on the Dolph Court property. The parish hall was built in 1981, and services were held in that building for the next 15 years. 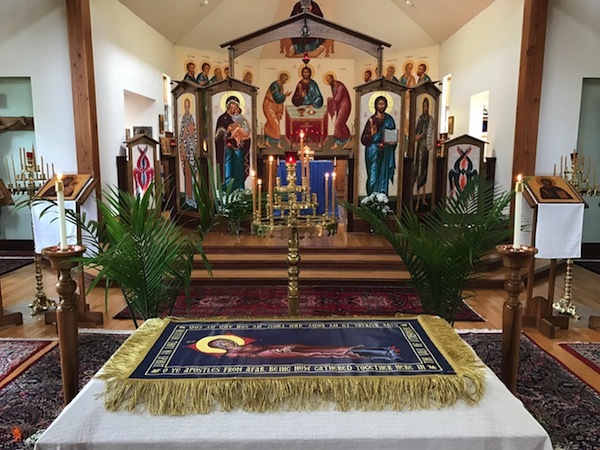 As the centennial of the first Orthodox Divine Liturgy in the city neared, the parish prepared to build a new temple, adjacent to the parish hall. Under the pastorate of Father George Gray, the parish asked Father Alex Vinogradov of Wappingers Falls, New York, a trained architect as well as Orthodox priest, to design the building. 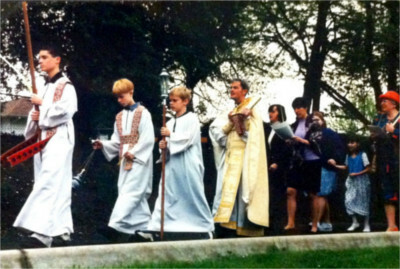 Father Alex enlisted a local architectural firm to oversee the project. 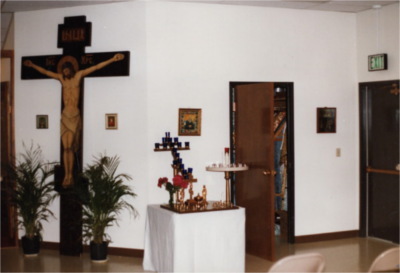 A general contractor was hired and excavation, and construction began during Holy Week of 1995. Heather MacKean moved to Portland at that time to take up the position of resident iconographer (and continues working in stages to complete the iconographic scheme of the building). 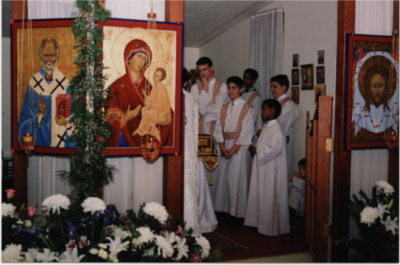 The first Divine Liturgy in the new church was celebrated on Palm Sunday, 1996. 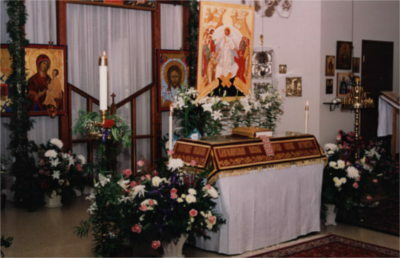 Metropolitan Archbishop THEODOSIUS (Lazor) presided at the consecration of the new church building on June 12-13, 1998. He was joined by 16 priests, four deacons, and about 300 faithful. Since that time, the congregation has grown steadily in many ways. Since its tentative beginnings in the tiny chapel, St. Nicholas Church has been under the care of 24 pastors (two of whom were eventually consecrated to the episcopacy); has been housed in five buildings; has been the home parish of at least eight seminarians; has been the mother church for 10 Orthodox congregations in the Portland area; has been the outreach center for three mission projects (in Ashland, Salem, and the Chemawa Indian School); and the spiritual home of hundreds, perhaps thousands, of faithful who live or have lived in the Portland area.